How to Disable Applications on a Xiaomi Phone You Don’t Need, In 2018 ago, Xiaomi managed to rank fourth in the world and second in India. Of course, this is a proud achievement for Xiaomi during its struggle over the past few years. But sometimes Redmi users are often annoyed with the presence of bloatware (the default HP application) that is annoying because it consumes internal capacity and RAM even though it is not used. 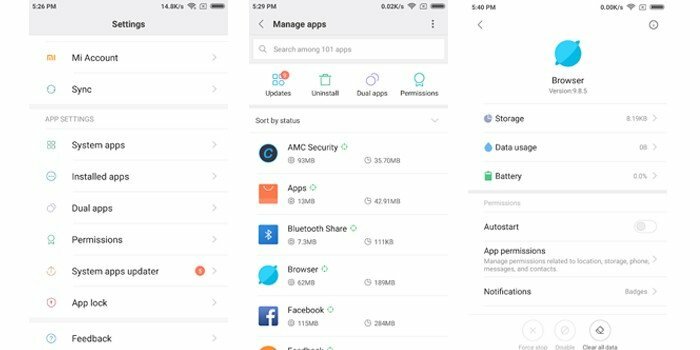 For this reason, many Xiaomi smartphone users are curious to deactivate this useless application so as not to consume too much RAM capacity. Well, for those curious Gadgets who want to deactivate the application, you can see the tutorial as follows. For the record, applications that can be deactivated on Xiaomi phones are usually the default applications that have been around since the beginning of the purchase because usually the applications that are installed themselves can still be uninstalled or installed as desired by the user. But Gadget must be careful not to mistakenly disable applications on Xiaomi phones because some of them are applications for system components. If the system component’s application is disabled, it will usually have a fatal effect on the operation of the operating system. Even it will often hang when it is wrongly deactivated. Meanwhile, if the gadget wants to reactivate the disabled application then it can return to the Installed Apps page found in the Settings menu. Later Gadget can choose the desired application, such as a browser. Also read: Here, the 10+ Best Android Download Manager Applications, Free! After the Browser info page opens, the gadget can directly press the Enable button to reactivate it. You could say the way this one is very easy to do by beginner Xiaomi users though. According to Infomint, is this one method practical to deactivate the application on the Xiaomi cellphone? But if the gadget has another way to deactivate the application, you can write it in the comments column below. Thank you.